Take a moment to imagine your dream come true best fishing vacation and what it would include: remote crystal clear waters swarming with record breaking trophy fish; a friendly, welcoming staff waiting for you at a renown Canadian fishing lodge; magnificent scenery wherever you look; gourmet meals each and every day. You'll find all this and more at Kasba Lake Lodge, located in the Northwest Territories, close to the Manitoba - Saskatchewan border. Northern Pike: 54 inches, 36 lbs. 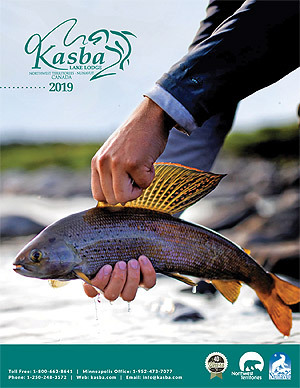 No matter what you're looking for in your fishing vacation, you'll find it at Kasba, Canada's premier fishing lodge. Our fly-in fishing experience places you in untouched wilderness, far from roads and RVs, for the best legendary fishing. Thanks to nature and our long-time catch and release policy, you'll catch some of the biggest fish at any Canada fishing lodge. Whether this is your first, fifth, or twentyfifth stay at Kasba, we welcome you to our family. Kasba Lake Lodge - Canada's Best Fishing Experience from Matt Hill on Vimeo.